We are very excited to announce that we are part of Melita Thomas’ book tour for “The King’s Pearl” – if you haven’t purchased the book yet I’d highly recommend you do so. There are not many books available on Queen Mary I of England and Thomas does a marvelous job at bringing her to life in this well researched book. Most people probably consider Mary Tudor as dour and joyless, a perpetual stream of prayers and tears. But nothing could be further from the truth, especially during her youth. From an early age, Mary’s greatest passion was music. Her first recorded words, when she was about two years old, were to call out ‘Music! Music!’, when she caught sight of her parents’ favourite musician at a state occasion. Nothing would satisfy her but that the musician, Friar Meno, who had once been an organist in St Mark’s, Venice, should play for her. She herself learnt to play several musical instruments – the lute and rebec (a type of lute, played with a bow) and keyboard instruments – spinet, virginals, harpsichord and regals (a small organ). Dancing too, she delighted in. At the age of about eight, she danced in front of the Imperial ambassadors, for them to report on her accomplishments to the Emperor Charles, at that time her betrothed. She ‘twirled so prettily that no woman in the world could do it better’. At the age of nine, when she went to live in the Marches of Wales as de facto Princess of Wales, instructions were given for her continue her instrument practice, but without ‘fatigation’. Henry also arranged for jugglers to visit her vice-regal court to entertain her. During the years 1533 – 1536 when Mary was cut off from her mother, Katharine of Aragon, her former governess, Lady Salisbury, and all her friends, and forced to live as a subordinate in the household of her half-sister, Elizabeth. Katharine wrote to her, advising her to solace herself with her music – if she had been allowed to keep her instruments. After mid-1536, when Mary had been forced to accept that her parents’ marriage had been invalid, and that she was illegitimate, she was welcomed back to Henry’s court, and given an allowance and a suite of attendants. There are detailed records of her personal expenditure over the next few years, so we can see exactly how she spent her money, and what her amusements were. Mary generally liked the outdoors. From a very early age, she had learnt to ride and hunt – although hunting for ladies at least, tended to be within the parks of the royal houses, rather than across open country. There is an early record, from when she was about six years old, of a forester at Windsor receiving a tip for bringing a picnic to the princess’ hunting party. One of her items of expenditure was her greyhounds – they were used for coursing, and Mary kept a kennel of them. They had their own keeper, a man named, Christopher Bradley, who was paid 34 s 8d per half-year for his wages and the dogs’ ‘meat’. On at least one occasion, the dogs ran amok and killed a farmer’s sheep, for which Mary paid compensation. In 1538, she and her greyhounds were in Waltham Forest, hunting, probably alongside Henry. She also had pet spaniels, and even received a parrot as a gift. Being deprived of her accustomed exercise of riding during the difficult years when Anne Boleyn was queen, had a material effect on both Mary’s physical and mental well-being. Once she was reconciled to Henry, one of the first gifts she received from his minister, Thomas Cromwell, was a horse, for which she expressed warm gratitude, saying how much she valued the opportunity for regular exercise. This love of activity is reflected in a description of her from 1541, in which the French ambassador, Marillac, reported that she would walk two or three miles early each morning, and even when she was indoors, was seldom seen to sit down. One of her other outdoor entertainments was archery. She bought a quiver, and bows and arrows from time to time. Like hunting, this was a sport she enjoyed with her father. On one occasion when he ordered arrows, he specified some to be set aside especially for Mary. When she was feeling less energetic, she liked to walk in the gardens of the various royal palaces, and there are numerous entries in her accounts for tips for gardeners, and for people bringing her gifts of flowers and fruit. Unlike most women of the age, Mary appears to have had little taste for needlework – it was probably too sedentary for her. One of the first appointments made to her new household in 1536 was a fool, Jane. Jane remained with Mary for many years, and there are numerous references to payments for her clothes and shoes, for medical bills, and also for having her head shaved – there is nothing to indicate whether this was customary for fools, or whether there was some particular reason for Jane’s hair to be shorn. There were regular payments for her instruments to be tuned, and monthly music lessons for both the virginals and the lute. The dancing continued – to such an extent that her half-brother, Edward, aged eight, wrote to Queen Katherine Parr, their step-mother, asking her to persuade Mary not to spend so much time on ‘foreign dances and merriment, which do not become a most Christian princess’. Second only to music, was Mary’s passion for gambling. Gambling was endemic at the Tudor court, but Mary played frequently, and for high stakes. She gambled on cards, but also on games, such as bowls, and made other wagers. She frequently had to borrow money from her ladies-in-waiting as she ran out of money during the evening. On one occasion she lost the vast sum of £10 to her doctor – disappointingly, we don’t what the wager was. She bet her breakfast on the outcome of a game of bowls, and lost a frontlet (part of the headdress) to her cousin, Margaret, Countess of Lennox on another occasion. It is probably fair to say that Mary was a great deal more fun-loving than her reputation suggests. 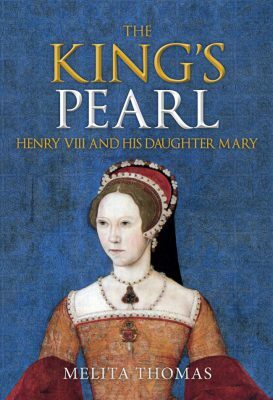 Interested in reading “The King’s Pearl – Henry VIII and His Daughter Mary” by Melita Thomas?